Step 1 Heat the oven to 300 degrees. Coat an 8-by-12-inch baking dish with one-half tablespoon olive oil. Add half the potatoes in a slightly overlapping layer and sprinkle with half the salt and pepper. Step 2 Scatter the bay leaves and onion over the potatoes and cover with the remaining potatoes, sprinkling again with salt and pepper. Spoon the remaining oil over the potatoes. Step 3Bake for 30 minutes. Cover the pan lightly with foil and return it to the oven in a rotated position. Bake 20 minutes, until the potatoes are almost tender. Step 4Increase the oven temperature to 450 degrees. Sprinkle the sherry over the potatoes, cover again with foil and continue baking until the sherry is absorbed and the potatoes are tender, about 10 minutes. Sprinkle with parsley and serve. In Recipes-list.com we have selected the most viewed recipes from category - Sides Vegetarian . Enjoy the best recipes specially selected for you! 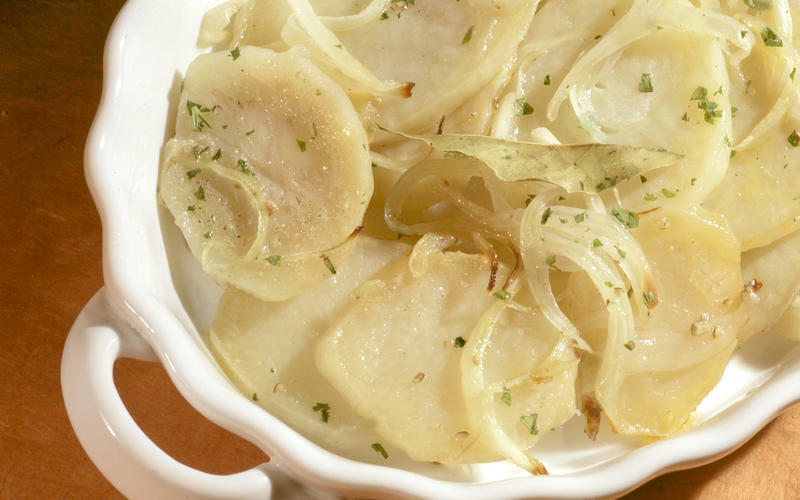 Fernando's sherry-infused baked sliced potatoes is the right choice that will satisfy all your claims.